Suitable Ages:Girls 2-3-4-5-6-7-8-9-10-11-12 years. The perfect fit for any little princess. Custom color and size are available. Please send a message to inquire before ordering. 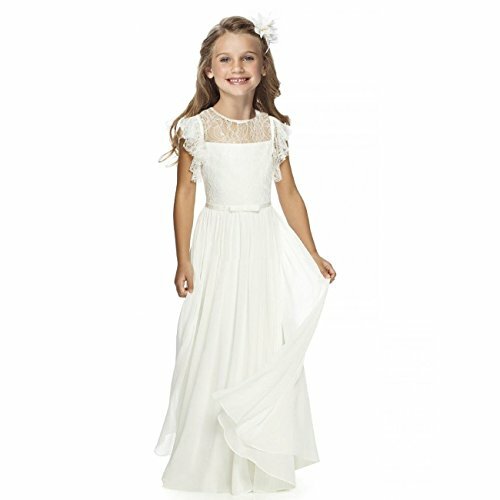 Occasions:Long white dress for girls,wedding,prom,pageant,first communion,birthday,party. Or for everyday wear. 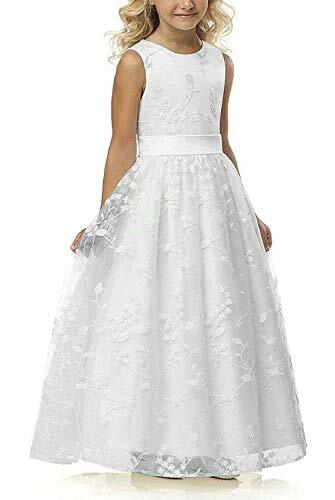 Flower Girls Dresses 2-12Y Pls check the size measurement carefully before purchase Size || Bust || Waist || Height 2 | 20.9''/53cm | 20.1''/51cm | 38.6''/98cm 4 | 22.8''/58cm | 21.3''/54cm | 43.3''/110cm 6 | 25.2''/64cm | 23.6''/60cm | 47.2''/120cm 8 | 27.2''/69cm | 24.4''/62cm | 51.2''/130cm 10 | 29.5''/75cm | 26.0''/66cm | 55.1''/140cm 12 | 31.9''/81cm | 28.3''/72cm | 59.0''/150cm If you want to make a custom dress,please give me your size as follows: 1.Full Bust _____ inch or ___ cm 2.Waist _____ inch or ___ cm 3.Hips _____ inch or ___ cm 4.Shoulder to Shoulder ____ inch or ___ cm 5.Waist to floor (Waist to Feet) ____ inch or ___ cm 6.Hollow to waist(Front Length Shoulder to Waist) _____ inch or ___cm 7.Hollow to floor(Shoulder to Feet without in shoes) ___ inch or ___ cm 8.Height: _____inch or ___ cm 9.The height of your high heel shoes: _____inch or ___ cm 10.Phone Number______ 11.The date you need the dress_____ essory, such as wedding veil,gloves, shawl, crown,etc. A simple beautiful dress for your beautiful girl. Sleeveless solid top with exquisite embroidery on the waistband. The tea length, double layered tulle skirt is speckled with tiny flowers. 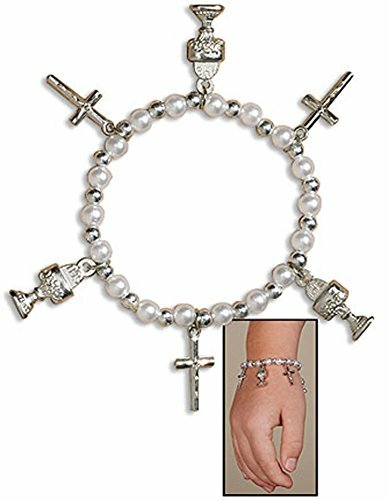 First Communion Bracelet with Chalice and Crucifix Charms. Adjustable stretch bracelet, one size fits most. This beautiful dress is sleevless and has a satin bodice. The waistline is made of embroidered lace with sequins and beads. 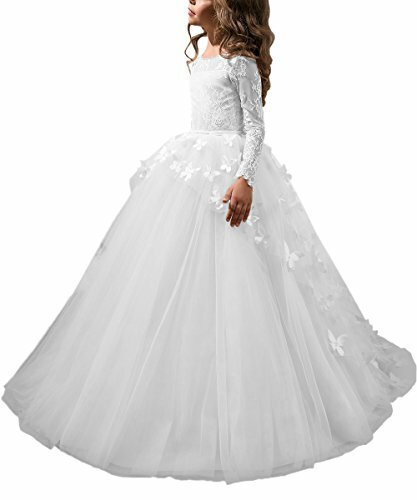 The double layered tulle skirt has decorative flowers in the front. The skirt is finished up with wire hemming. 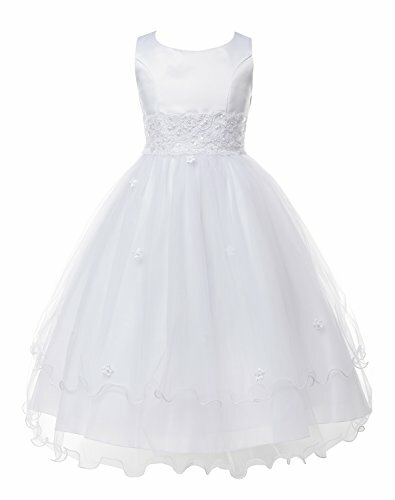 The dress features Full A line Communion Flower Girls Dress. The Beautiful Pearl Trim to Accent the waist.The dress is finished with a satin sash. Full length. Ribbon tie and back zipper fastening for easy dressing. 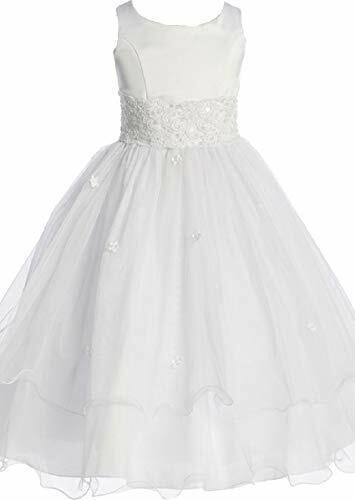 Have your little girl wear this dress for Flower Girl Dress, Christmas, New Years, Easter Girl Dress, and other Formal Events. The elegant feature is made out of Satin Poly upper body and sleeveless bodice with an elegant 5 tiered Shimmering Organza skirt. The waistline is decorated with a removable Satin Poly Sash and Flower to make this dress more elegant. .*The back of the dress has a zipper closure and a nice bow you can tie for a snug fit. The elegant bodice feature is made of White poly satin with floral pattern Lace. The waistline is decorated with a tie-bow sash and flower to make this dress more elegant. The skirt has 4 layers, the inside layer is satin attached with a netting for additional fullness. the top layer is actually a double layer of fluffy tulles with rose petals and leaves wrapped in it to make this dress more beautiful. The back of the dress has a zipper closure and a nice tie-bow to give it an elegant look. 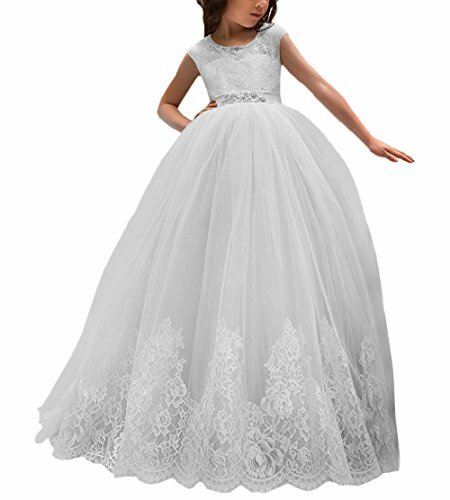 The elegant upper bodice feature is made out of white lace with white tulle bottom.The back of the dress has a zipper closure and the waistline is decorated with removable hand tie sash and matching flower. The skirt has 5 layers (SEWN TOGETHER), top 1st and 2nd layers is made of elegant tulle. 3rd 4th and 5th layers are attached crinoline netting and soft satin lining to bring comfort to your little girl while wearing the dress. The elegant bodice feature is made out of Satin Poly. The waistline is decorated with a removable satin poly sash to make this dress more elegant. 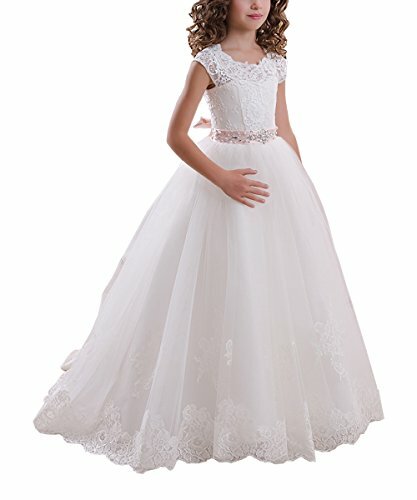 The skirt has 4 layers (2 layers SEWN TOGETHER), top 1st layer is made of elegant satin poly, the 2nd layer is a soft satin lining, 3rd layer is a white attached crinoline netting for additional fullness and the 4th layer is another layer of soft satin lining to bring comfort to your little girl while wearing the dress. The back of the dress has a zipper closure and a nice bow you can tie for a snug fit. To book an appointment at KoKo Collections, located in Fashion City 20B, Ballymount, Dublin 24 please visit our website at www.kokokids.ie to book online, or Call us on (01)4452118.